JOY�s contribution to Book-Block preparing is well acknowledged by the binding fraternity. Rounding & Backing is yet another milestone in our endeavour to continue our efforts in finding solutions for Book-binders. Rounding & Backing is the most important requirement in Hard-cover Binding Process to withstand heavy stresses with the help of structural shape similar to architectural curvilinear form identical to Roman Arch, thus attaining overall durability, usability and enhanced aesthetics. Rounding: Convex shaped spine generally required for soft-cover bound Bibles, Diaries and Note-Books etc. The process of Rounding is to bring the swell into a controlled form in which the spine-width does not extend beyond the Edge of the Book-block. Rounding is produced by means of two rollers rotating uniformly under hydraulic pressure to a pre-set Arch. Backing: The process of shaping a shoulder or creating space for formation of the Joints on both sides of the Binding (Spine) Edge. Space known as BACKING is provided to accommodate the Board-thickness and covering material of the Case. The rounded spine is evenly distributed by means of a Backing Roller as the signatures are flared from the center outward to progressively interlock with each other at 45 towards the edges, thus forming the BACKING. Effects of Rounding and Backing on the Text Book: The signatures of the Book remain flat at the centre and those in-between, form the backing, providing a hinge line from which the cover will pivot. Unlike flat backed Text-books, the strain on the signatures is relieved allowing the spine to retain its shape while enhancing comfort level in opening. The easier a Text-book opens, the longer it will last. 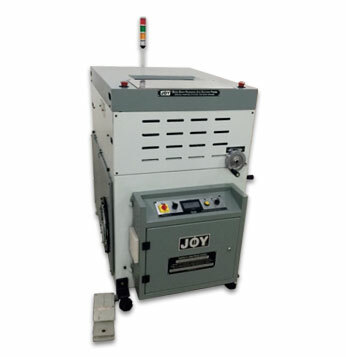 Robust, reliable and simple to operate, as soon as the Book-block is inserted and the foot-switch activated, the machine will maintain the curvature automatically. The curvature of the convex shape and the size of backing can be set to suit respective Book-block requirement. PLC based operating panel ensures consistent results and easy diagnostics.